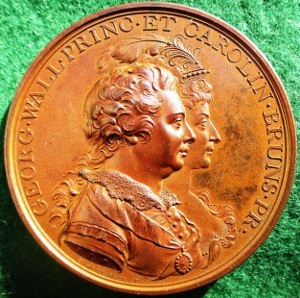 Notes: The marriage took place on 8th April 1795 at St James’s Palace in London (the medal gives 1797 in error). The Prince of Wales was drunk throughout – having famously asked for a brandy after first seeing his bride-to-be. The marriage was not a happy one. 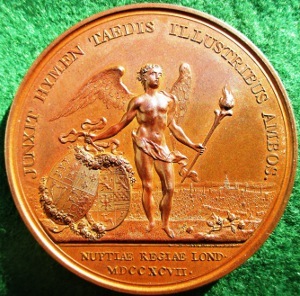 The view of London on the medal’s reverse is taken from a 1751 painting by Canaletto.